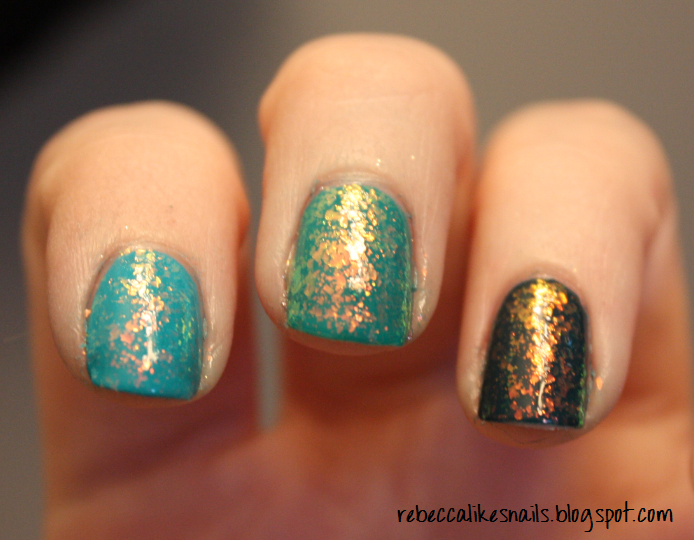 rebecca likes nails: teal & hidden treasure! So my most faithful reader, Jess, wondered what Hidden Treasure would look like over teal. 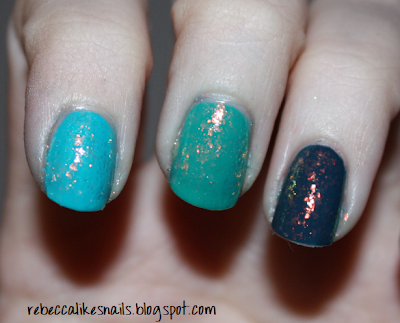 Left to right: LA Colors Color Craze - Sea Siren, Atomic, and OPI - Ski Teal We Drop. I don't see how Ski Teal We Drop is actually teal, but it's in the name, so I included it! The hidden treasure kinda got lost against the lighter colors. It was hard to get this picture and it wasn't visible IRL unless you turn your nails around to reflect different lights. When I could see it, it was lovely! Here is how it looked most of the time. Pretty much always visible on the darker color but not so much on the others. Did that satisfy you, Jess? I hope so! I definitely see what you mean, it looks better over darker colors. It does look better than pearl harbor though. OMG! I love it over Atomic!! !